Nestled in the White Mountains of New Hampshire, up a gravel road, on a hillside that is lined with billowing birch trees, stands the most perfectly, rustic, yet simply elegant barn. A truly special barn, one that was sought after, discovered, and moved to this location for the purpose of creating a happy haven for functions and events…. 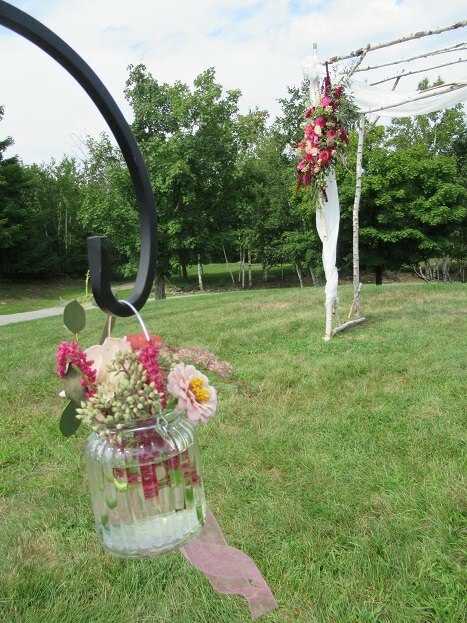 but ultimately to house the union of loving couples, the barn is a magical wedding venue. The barn set the stage for what was a beautiful wedding weekend; fill with wonder, wishes and wildflowers. 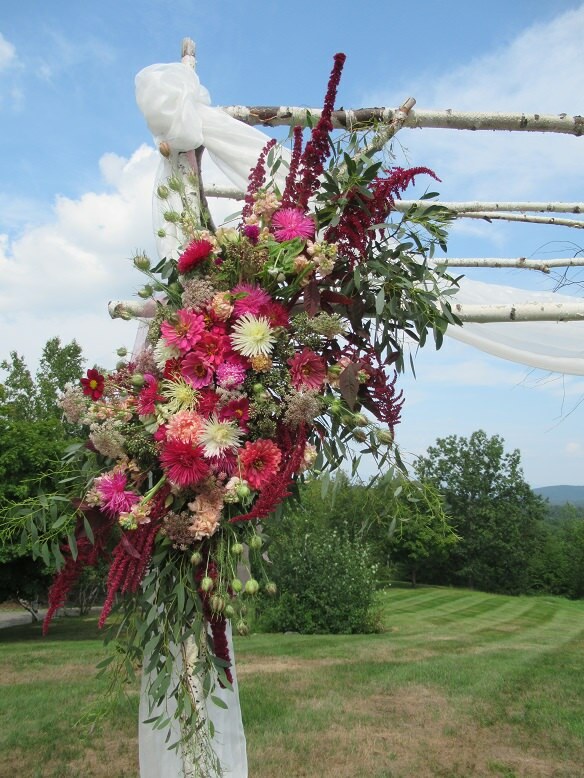 The marriage ceremony took place on a lush, green, grassy hillside, that overlooked, pastures and fields, and the vows were spoken under a birch branch arbor, that was draped in sheer flowing, fabric, with an ornate cluster of wildflowers. Natural, and elegantly rustic, was the theme of the wedding, highlighting the natural beauty of the surroundings, and glorifying the importance of family and friends was the clear message of the joyous union. Wildflowers grow in fields just minutes from the venue, the brides wish was to have the wildflowers grace the tables and be used in the centerpieces at the wedding reception that was held in the glorious barn. I was pleased to be asked to help pull the centerpieces together, it was such a wonderful experience. The wildflowers are cut in the field by hand, and sold by the pound…..imagine, flowers by the pound it was an eye opening education for me! 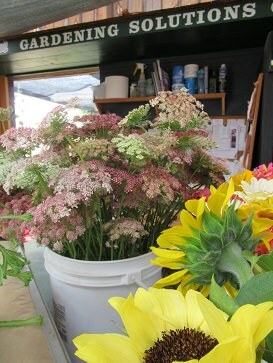 There are one hundred stems in two pounds of Queen Anne’s lace….who knew? 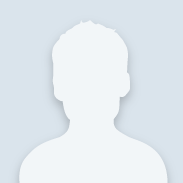 How great is this! 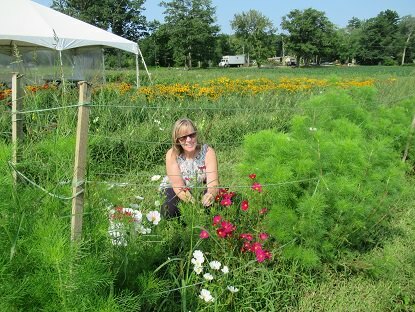 We gathered cosmos, snapdragons asters and zinnias; there was gomphrenia, salvia, grasses, and anything else that was growing in the fields that looked pretty….weeds take on a completely new appreciation when they are growing amongst proper wildflowers. 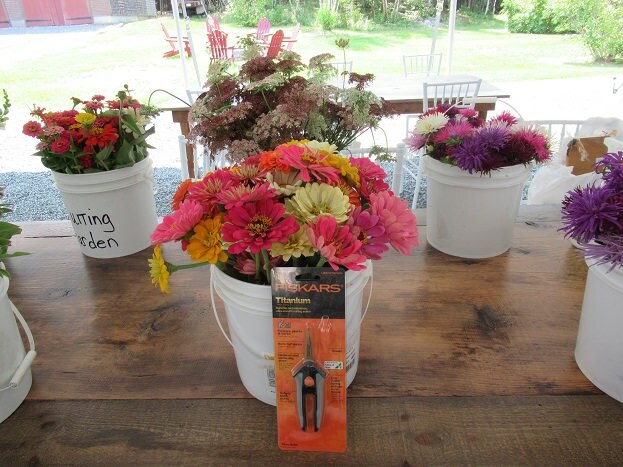 We loaded buckets of wildflowers and brought them back to the wedding barn. 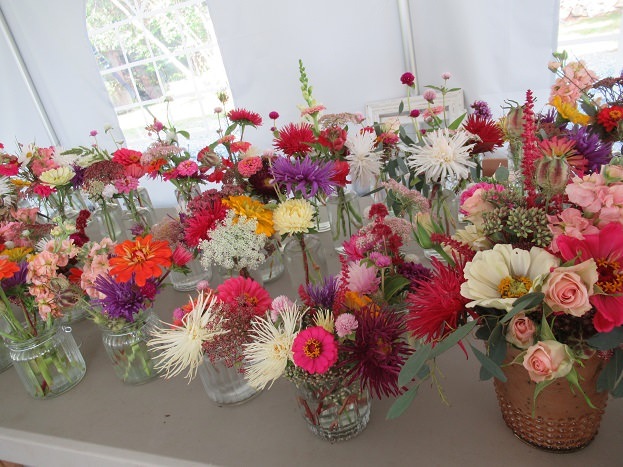 A team of wildflower lovers snipped and cut, sipped and laughed, we filled over 190 tiny bottles and jars, arranged and stuffed several vases and a few jugs with nature’s tiny masterpieces…..they were naturally perfect! I assembled a cluster of wildflowers for the arbor, some of the large flowers I brought from Boston. I snipped the stems before the journey to ensure they took up plenty of fresh water to stay hydrated. The arrangement was assembled using oasis foam and ended up weighing about 5-6 pounds, we used zip ties to attach the wildflowers to the arbor. It was a spectacular wedding with a stunning bride and groom accompanied by a bridal party that was, each and every one, supportive and breathtaking! It was such a pleasure to be part of such a special event! 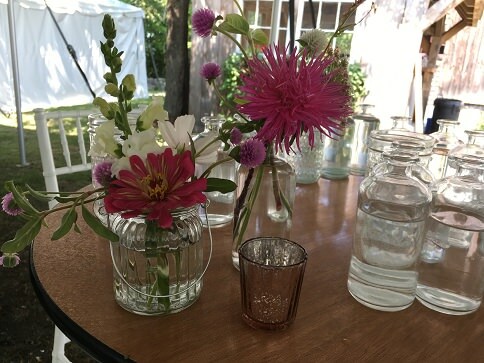 I like the beautiful flowers that appear in the wedding party!